New generations should learn copyright moral and ethics, the idea was, and a few months later the first version of the new “Cracking Ideas” curriculum was made public. The videos try to explain concepts including copyright, trademarks, and how people can protect the things they’ve created. 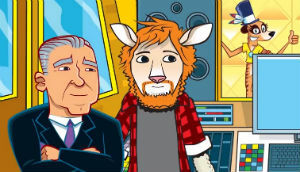 Interestingly, the videos themselves use names of existing musicians, with puns such as Ed Shealing, Justin Beaver, and the evil Kitty Perry. Even Nancy and the Meerkats appears to be a play on the classic 1970s cartoon series Josie and the Pussycats, featuring a pop band of the same name. But that didn’t stop the IPO from using his likeness for their anti-file-sharing campaign. According to Catherine Davies of IPO’s education outreach department, knowledge about key intellectual property issues is a “life skill” nowadays. While we doubt that these concepts will appeal to the average five-year-old, the course material does it best to simplify complex copyright issues. Perhaps that’s also where the danger lies. The Pirates of the Internet! Jim Killock, director of the Open Rights Group, notes that the campaign is a bit extreme at points. “Infringing copyright is a bad thing, but it is not the same as physical theft. Many children will guess that making a copy is not the same as making off with the local store’s chocolate bars,” he says. Killock also stresses that children copy a lot of things in school, which would normally violate copyright. However, thanks to the educational exceptions they’re not getting in trouble. The IPO could pay more attention to these going forward. Perhaps Nancy and the Meerkats could decide to release a free to share track in a future episode, for example, and encourage kids to use it for their own remixes, or other creative projects. Creativity and copyright are not all about restrictions, after all.